Baby shower games are a great way to break the ice and keep the party rolling. It's wonderful to welcome the new arrival into the world and offer gifts and support to the new parents. You'll also need some fun activities to keep all of the guests entertained. Word games are a popular activity to do while sipping on punch and eating cake. These games can include anagrams, word searches, crossword puzzles, even Mad Libs, all with a baby theme. You can build your own word searches or use ones that are already created. You can find great printable baby shower games online including mixed-up baby words and the baby letter game. Ask guests to give shower hostesses a baby picture once they've sent in an RSVP to the baby shower. One of the hostesses should number each picture and scan all of the pictures into a document. She should then make enough copies to give to each person. As each guest arrives, hand her a copy of the pictures along with a sheet of paper. Guests should then attempt to guess the name of each person, placing that name beside the number of the corresponding baby picture. The person who gets the most guesses correct wins. If you have a large guest list or a guest list in which most guests do not know each other, use only the pictures of the mom-to-be and her family, such as mom or mother-in-law, sister, sister-in-law, niece, cousin, etc. Starting with the letter A, work your way around the room, with each person in turn saying a name that begins with the next letter of the alphabet. For example, the first person might say 'Anne,' the second person could say 'Barthalomew,' and so on. A person is eliminated when they can't think of a name within, say, 10 seconds. This shower game is a real classic, but don't try it if mommy-to-be is sensitive about how much weight she's gained. Using a roll of toilet paper or a spool of ribbon, each guest guesses how much will be needed to go around mommy's stomach, and then each person gets to see how close (or far off) they were. Place 30 or 40 items related to babies (diapers, pacifiers, toys, bottles, etc.) on a tray. Let guests look at the tray for two or three minutes, then take it away and have them write down as many things as they can remember. Put jellybeans or candies in a glass baby bottle (count as you put them in) and have guests guess how many pieces are inside. The winner gets to take home the candy. Get a variety of baby foods and have each person taste them and see if they can figure out what food it's made out of. If you have a big crowd (or want your friends to still be speaking to you after the party), you can have them smell the food instead of tasting it. This is a game you won't know the result of for a while, but have the guests guess what day the baby will be born, whether it's a boy or a girl (if the parents don't know), what time of day it will be born and the weight and length. If you want to collect money for the bet, use it to buy a gift for the new parents, but you can also give the winner some sort of prize. Pick some action that you want to carry the game through the party, like someone sitting in a certain spot, holding a plate or standing. Set a timer to go off every 15 or 20 minutes and whoever is doing the secret action has to give the new parents a piece of advice. 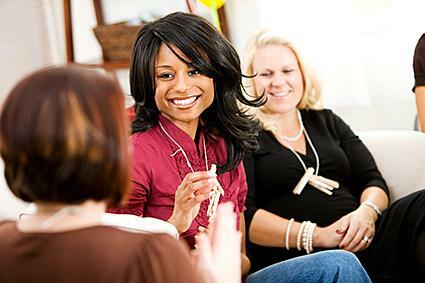 While giving advice certainly can't be considered one of the new baby shower games, organizing the advice into a game can make the advice less overwhelming for the mother-to-be. Come up with a short list of difficult baby care situations before the shower, and ask guests to either write down their most pressing baby care questions (for guests who are not mothers) or write down a question they had when they were a new mother. Then, ask guests to come up with not only their best solution to each situation, but also their most creative solution to each situation. With the right crowd, this game can turn into a real laughing matter. At the beginning of the shower, give each guest one to four clothespins, and have them put them on their clothes. Then announce a rule for the shower. It can be something like guests are not allowed to say the word "baby" or the name of the coming child, or they can't cross their legs.. Whenever someone catches someone else doing the thing that's not allowed, she can take one of that person's clothespins. The person with the most clothespins at the end gets a prize. This game is taken right from the popular game show. Choose 10 to 20 baby products and place them on a table. Give each guest some paper and a pencil, and instruct them to guess how much each item is. The guest with the most correct guesses wins! Give guests a Xeroxed sheet of events that happened to either the mom or dad-to-be. Have the guests try to match each event to the correct person. The guest with the most correct matches wins! Guests are given a sheet of paper, and they must write down as many song titles with the word "baby" in them as possible. This works well with teams, and this game can also be adapted for books, TV shows and movies. Come up with a list of songs that might be sung by mothers trying to soothe a baby, such as You Are My Sunshine and Rock-A-Bye-Baby. At the shower, recite a certain portion of the lyrics, and ask the guests to continue the song. The guest who knows the most baby songs by heart is the winner. This game can also be played using nursery rhymes in place of songs. Come up with a list of nursery rhymes, such a "Pat-a-cake", and play the same game as above asking guests to finish the rhyme. Summarize several popular children's books and ask guests to come up with the title of the book and/or the author. "What is their favorite restaurant?" "What is their favorite hobby?" The guest who answers the most questions correctly wins a door prize. This game is always a favorite. You'll need to have enough prizes on hand so that everyone has a gift. Be sure they're all wrapped, and place them in the center of the room. Let each guest draw a number, with the number one going first. That guest will need to choose a prize from the pile and open it. The next guest can either "steal" that gift from the first person or choose a new gift from the pile. The game is played until all the gifts are chosen. Hand a blank sheet of paper and a pen or pencil to each guest. When the signal is given, instruct the women to write down every baby-related item they can think of. After a given time, such as one minute, instruct guests to stop writing. The woman with the most baby items on her list wins a prize. Arrange several baby items in a paper bag or basket. These could include a bottle, pacifier, bottle brush, bulb syringe, thermometer, nail clippers, pacifier holder, booties, etc. Blindfold the mom-to-be, and watch her try to guess each of the items as she picks one up out of the bag. Try to look for more interesting baby items that will be more difficult to guess like a teething biscuit. Take a large pair of men's pants and find some items that can be strapped onto guests' middles (inside the pants) that add not only bulk, but also weight. Have a relay race in which teams have to not only run, one guest after another, but also have to transfer the "baby weight" and pants between each guest's trip through the course. Lots of laughs are sure to result. This isn't really a game, but it is an activity that will create precious memories for the parents and, one day, the child. Hand out colorful note cards to each guest as she arrives for the shower. Once everyone has gathered together, instruct the women that they are all the new baby's fairy godmothers. Their task is to give the baby one virtue, just as virtues were given to Sleeping Beauty when she was a baby. Virtues could include wishes such as good health, sunny disposition, intelligence, musical talent, artistic ability, etc. Along with the virtue, the "godmother" should write a personal note to the parents. All of these cards could then be compiled into a scrapbook. Be sure all the participants sign their names to their cards! Diapers are a staple withbabies, so of course they are popular theme item at baby showers as well. From using diapers to determine the winner of a door price to speed-diapering contests, consider one of these popular diaper-themed games. 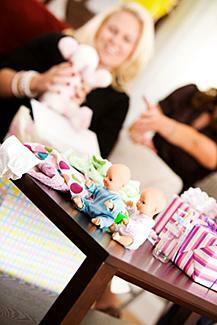 In addition to having an assortment of fun games, you can do something special for the mom-to-be. For example, purchase a terrycloth bath hoodie, some onesies or baby T-shirts and an assortment of fabric pens. Have each guest sign, draw, or write a special message on the item. Alternatively, you could have all the guests sign a picture frame or a scrapbook page, or have guests decorate scrapbook pages mommy can use in her baby book. If you're having games, someone will win each game, so you have to have prizes, right? In order to have something for everyone, use a broad range of prizes such as lotions, candles, candy and picture frames. You can visit a dollar store or discount store and find some great prizes for very little cost. For favors, cookies or candies done in a baby theme are a cute option that can also serve as decorations.